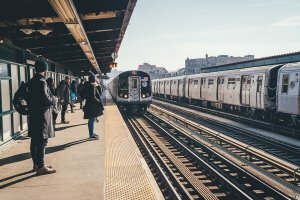 While most English natives know that syllables are the rhythm of the English language, many do not know the rules for breaking syllables apart. Syllables are the basic building blocks of words. You can break down any English word into at least one syllable! 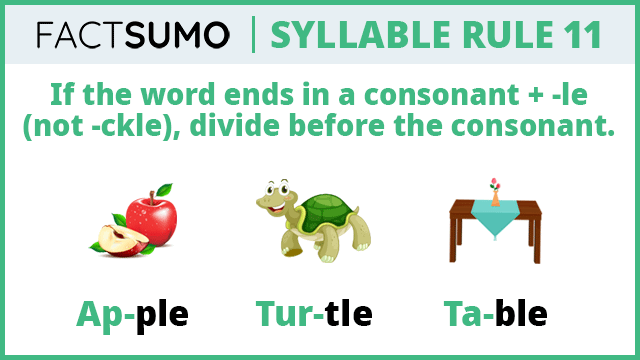 Syllables almost always have a vowel, and they can be accompanied by consonants. 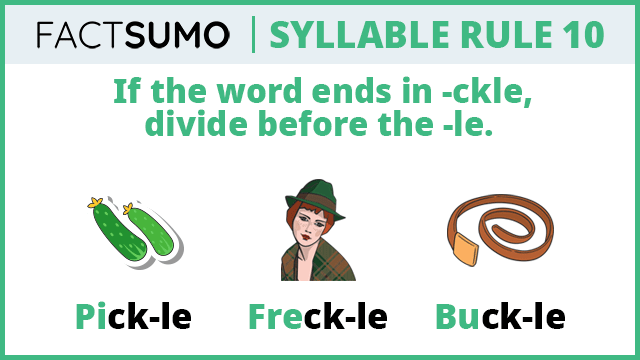 While most English natives know that syllables are the rhythm of the English language, many do not know the rules for breaking syllables apart. 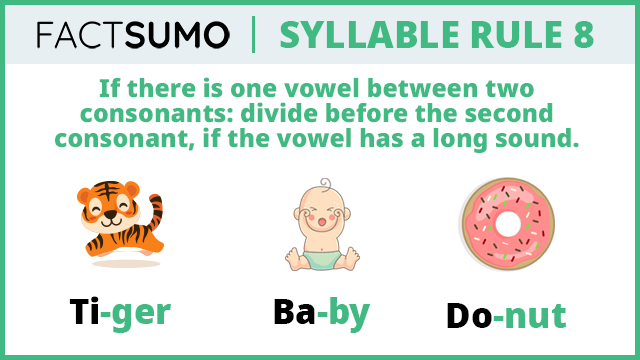 That’s why we here at FactSumo want to introduce the Twelve Syllable Rules, so you and your students can master the art of breaking down syllables with ease! People also define syllables as a single unit of speech. Sound is an important factor of syllables. 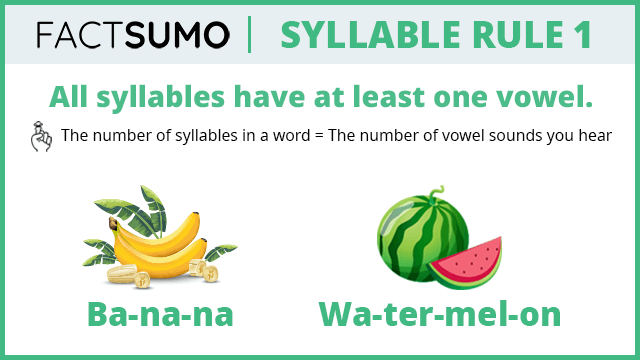 That’s why when we go through our five episodes on Syllable Rules, it helps to say the examples out loud so you hear the words separate into syllables! 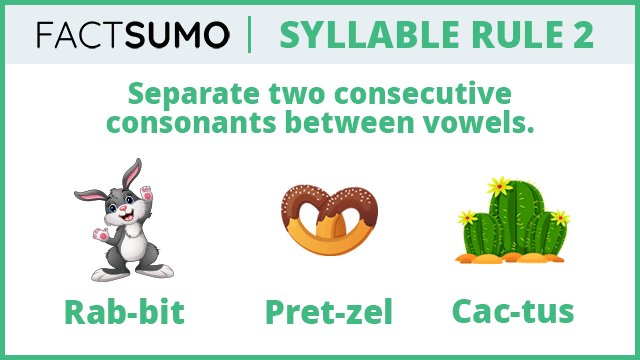 While it’s easy to hear syllables break down when you say them out loud, it can be a little more difficult to separate syllables letter by letter in writing. Turns out, there are very specific rules for separating syllables in writing. Don’t worry! FactSumo has you covered. It’s important to remember that rules in writing and spelling almost always have exceptions. The more you read and practice, the more you’ll recognize these! 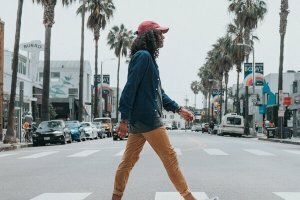 Our Twelve Syllable Rules, spread out over five awesome episodes, will go in-depth on these rules so you--and everyone you know--can master them! This first post will cover all the rules briefly, while the next five will explore them further. Ready? Let’s begin! We’re kicking off our list with a very simple concept! 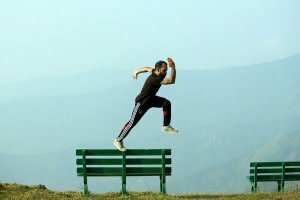 Every syllable in English has at least one vowel, and the number of syllables in a word is the number of vowel sounds you’ll hear in a given word. Let’s consider the word towel. We see here that this word has two vowel sounds in it. They are both short vowel sounds. Short vowels have a weak sound, while long vowels have a strong sound. 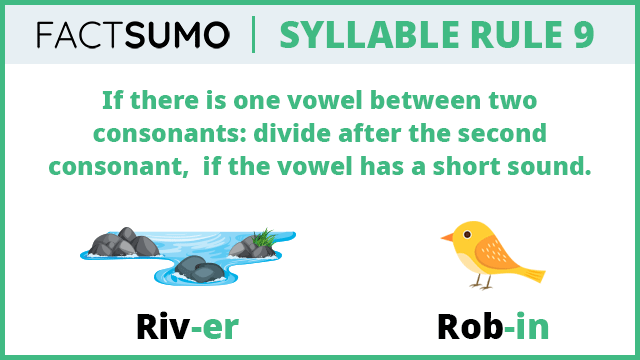 Since there are two vowel sounds, that means there are two syllables in this word! But how do you divide these syllables up using dashes (-)? Well, our next eleven rules will tell you exactly how. Let’s continue our list with a rule that’s pretty easy! All it says is if you have two consonants together, divide a syllable dash between them. Easy, right? The only time you don’t divide is when those consonants make a new sound, called a digraph. Some common ones include sh, ch, and ph. 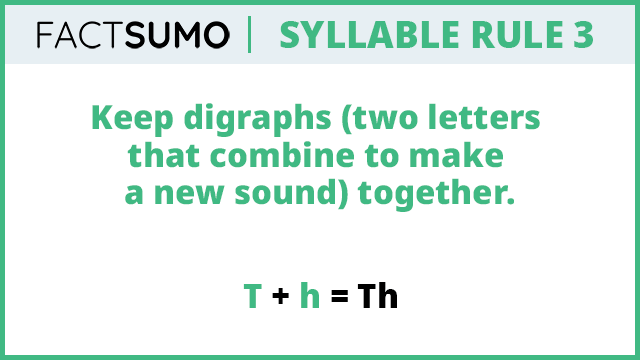 You’ll learn more about digraphs in our next rule! Examples include des-sert, fil-let, and hun-gry! In English, words don’t often end in i. So for the word hungry, the letter y stands in for the i! Notice how the last example has three consonants in a row, so we follow the rule and divide between the first and second ones. Also take note that double letters are NOT digraphs. So ss doesn’t count as one sound! Since we’ve discussed digraphs a little bit above, we won’t need too much new information to talk about rule number three. Digraphs are consonants that combine to make a new sound. Remember that consonants are all the letters besides vowels: a, e, i, o, u. Some common digraphs include sh, ch, th, cl, wr, gr, and many others! Notice how when you pronounce these letters alone, they make different sounds than when they are together! Digraphs like to stick together. So don’t separate them when you’re dividing syllables with dashes, because that’s our third rule! Here are plenty of examples for you: Whi-te; Sham-poo; Check-ers; Chi-na; Thun-der; Thurs-day. Many digraphs go at the beginning of words, but this isn’t always the case. Some examples of digraphs coming at the end include teeth and peach. 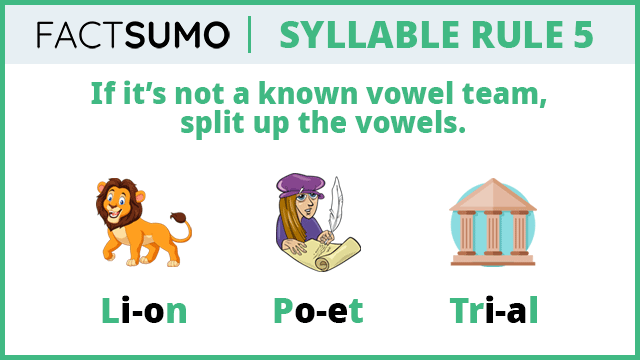 Vowel teams are similar to digraphs, except they are made up entirely of vowels. 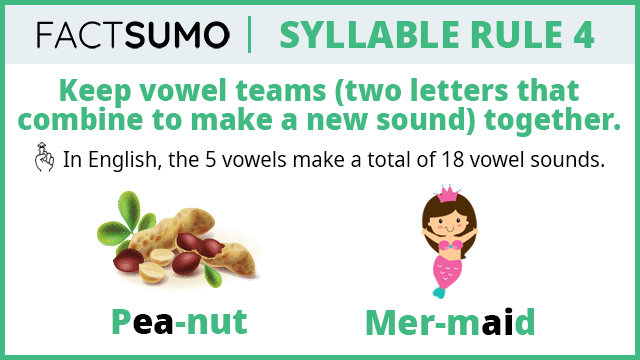 While there are only five vowels in English, they make up 18 different sounds! Just like digraphs, vowel teams make new sounds when you combine them. When counting syllables, keep vowel teams together. Some of the more common vowel teams are: ai, ea, oa, oe, ee, ue, oo. 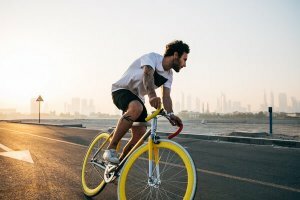 There are a few others out there, so keep your eyes peeled! Remember that these vowel combinations create an entirely different sound than if they are by themselves. Here are a few examples of how to keep vowel teams together: rain-wa-ter; book-store; school-yard; maes-tro. Notice that you don’t necessarily have to divide before or after the vowel teams, but they usually stay together. Remember, there are always exceptions to these rules! Rule five is simply showing you what to do when the vowel team isn’t known. There are fewer examples of this because many vowels go together to create new sounds, and so make a team. If they don’t go together, they are pronounced separately. A handy example of this is the word lion. Notice how the vowels are pronounced apart from each other. So, if we follow rule five, we’ll just divide between the two vowels: li-on! Another two awesome examples would be the words po-em and po-et! The vowels in these words are also pronounced separately from each other. Here’s another easy rule! To review, prefixes attach to the beginning of words to change their meaning, while suffixes go at the end of words, and change their form. 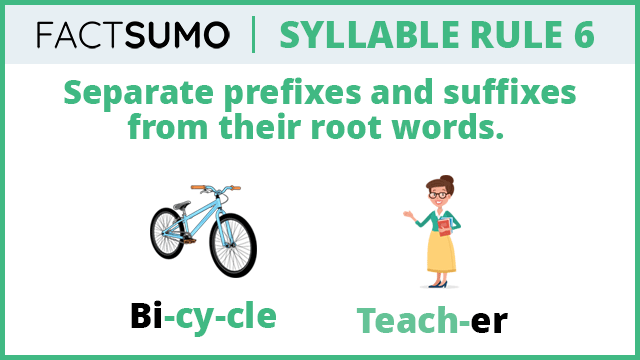 When we talk about syllables, prefixes and suffixes are simply separated from the root word. A few good examples would be re-do, help-er, and pre-heat. These words all have either prefixes or suffixes that change the word form or meaning. Compound words are two words that can stand alone and by themselves, but they go together to form a new word. You probably have seen a few compound words on your own, but we’ll list two here for you! The first example is the word raincoat. Can you guess what this compound means? It is a special coat for when it rains! If we follow rule seven, we divide between the two words that make up the compound. So, we get rain-coat! Flow-er-pot is a harder example. Flower and pot come together to create the compound word flowerpot, which is a pot designed for flowers. Notice we put a dash after the word flower because that is dividing between the compound word. Rules eight and nine concern long and short vowels. Long vowels usually appear at the end of a word or syllable, and sometimes pair with silent e or another vowel. Long vowels say their own name. You can think of long vowels as having a strong sound. If there are consonants surrounding a long vowel, place the divider before the second consonant. Some examples include ti-ny, ma-ple, and fro-zen. Note that each of these words produces the vowel letter sound (tIny, mAple, frOzen). Each vowel is surrounded on each side by a consonant, so we divide right between the vowel and the consonant on the right. Short vowels usually have one vowel in a word or syllable. They are often followed by one consonant. You can think of short vowels as having a weak sound. If consonants are surrounding a short vowel, divide after the consonant. This is the opposite of the rule above. Examples would be: fid-dle, riv-er, and fos-ter. Notice when you say these three words out loud, you can hear where they separate. 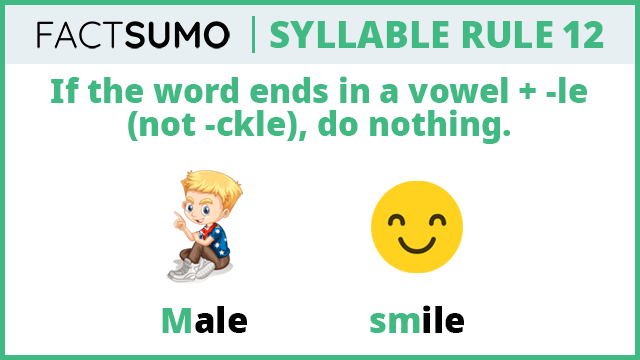 It may not be as obvious for other syllable pairs, but rule nine is easy to hear! This rule is easy to spot, because you just have to look at the end. And the method that follows is even easier. Just divide before the -le in -ckle at the end of a word. Simple as that! Some good examples include knuck-le, buck-le, and fick-le. Rules eleven and twelve go together. For the word that don’t end in -ckle, but end in -le, we use eleven and twelve to divide syllables. If the ending is a consonant + -le, divide right before the consonant. Ap-ple, han-dle, and sta-ble are all great examples of this rule! Finally, we’ve reached our last rule! Wasn’t so bad, was it? Rule twelve is quite similar to eleven, except this is for words that end in a vowel + -le. Remember, it can’t be -ckle. This rule, however, is even easier. You don’t divide the part of this word at all! dividers because they’re only one syllable! That’s all there is to it! If you weren’t satisfied with just these brief descriptions of our Twelve Syllable Rules, you can carry on to our first episode to explore these rules in-depth. Or, you could take time to try our decks on syllables. Remember, with FactSumo, it’s important to go at your own pace. 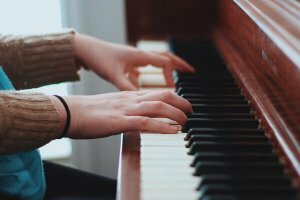 We want to inspire confidence through practice. And that means tackling the subjects you love to master the skills you need. 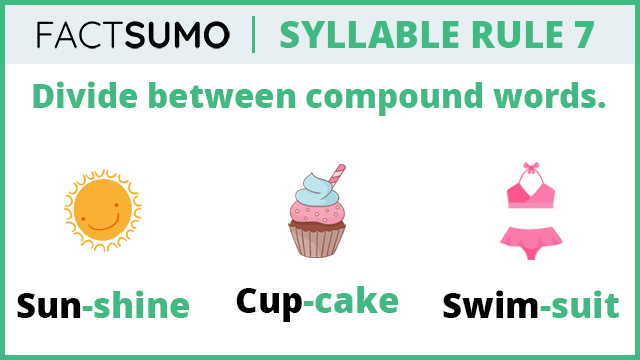 We hope you enjoyed this short guide to syllable rules; now go separate syllables like a FactSumo pro!